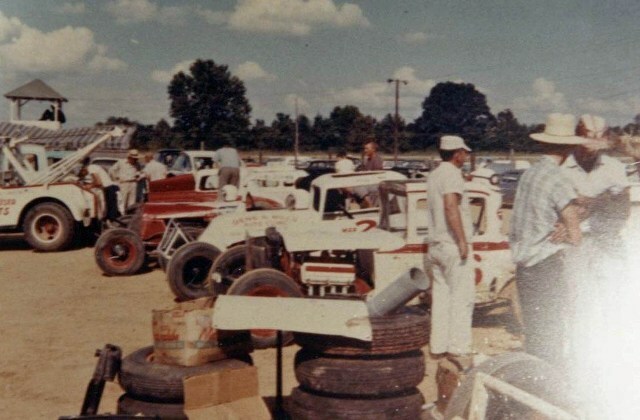 Jackson Speedway pits in 1959. Picture donated by Bobby Varnon. 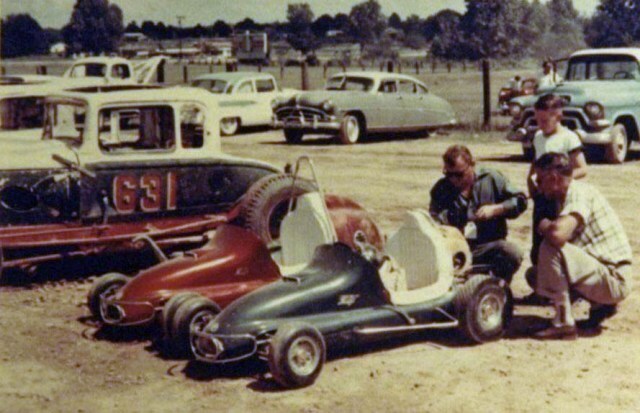 Chicken McComb had these 2 midget carts that his sons drove on the go-kart track during intermission. Chicken McComb is the man with the sun glasses and the young boy is his son Herbert McComb. Picture donated by Bobby Varnon. This roadster was driven by Robert Harper who raced it on the Drag Strip which was also located at the track. The man standing third from the right, in the brown shirt, is car owner T.G. "Blackie" Blackwell. The man standing to the right of T.G. and looking directly at the camera is the legendary Joe Fazzio. As told by Dean Blackwell (son of T.G. 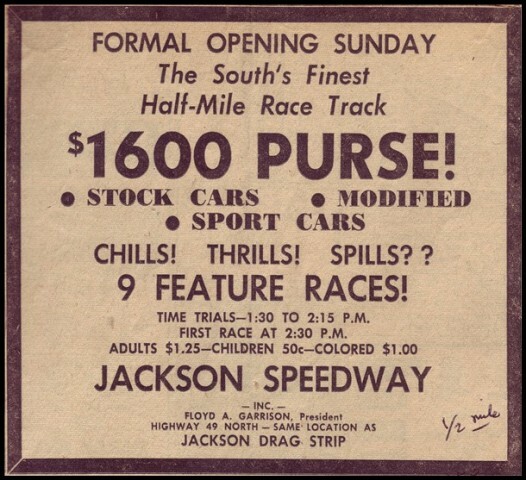 Blackwell): I have a little more information about a picture on your page about the Jackson Speedway. The bottom picture is a photo of a roadster that was build in Mendenhall by our body men James Maxwell and J. C.(Red) Murphy for my Dad in the late fifties. It has a nose that was made to look like the nose on the late version of the 76 car. 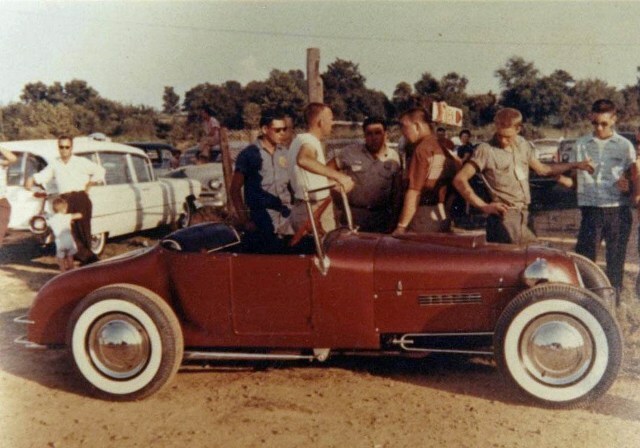 I will try to locate a picture of my Dad and some of his salesmen in the roadster at the Shriner's convention and parade in Jackson. At that event, Fugate Cockrell was setting on the back of the car with his feet inside the car on the seat. My Dad gunned the car causing Fugate to flip out of the car backwards and miraculously he landing on his feet. His suit had popped several seams but he was unhurt. They stopped and Fugate got back in the car taking the same position as before. About that time, a photographer showed up with his camera and tripod and said he was not ready last time and could they do the "trick" again. Needless to say Fugate would not consent to a repeat of the feat so the picture the photographer took was not an action shot ! James Williams and James Jr from Mendenhall showed me some pictures from your web site yesterday. I spent all evening looking at every page about cars before asphalt. I loved every minute of it. My hats off to you all for taking the time to put together such a great web site.